I wanted to share some exciting news, and give the heads up that we are heading into light-posting (aka vacation!) month. 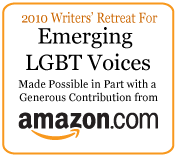 Next week, I’ll be attending the 2010 Writers’ Retreat for Emerging LGBT Voices, hosted by the Lambda Literary Foundation. I’m super psyched to have been picked along with 32 other amazing LGBT writers (including fellow radical doula Valerie Wetlaufer!). I’ll be in the non-fiction track, working on a manuscript for a book project that has been in the works for a year or so. Yay! It’s my first time with formal writing instruction in non-fiction and I’m super psyched. I will also be taking some time off (mostly). As a self-employed writer and consultant, vacation is tough. But it’s also crucial. So I will be partially disconnecting until Labor Day. The plan is to still have some posts here at Radical Doula, but we’ll see how that goes. I will also be spending a week on this lovely lovely organic farm I worked at last summer. Whoa! That is fantastic news!